Have you ever hunted deer where you had a chance to watch a great big buck coming towards you? He walks a few steps then he stops. His sharp senses are checking everything, he might seem like he is stareing straight at you, it will seem like a long time. Nothing spooked him, then he walks some more, slowly getting closer. The hair on the back of your neck seems to prickle, your skin has a tingling sensation, you can feel and hear your pulse in your ears. The monster buck continues to come closer, just before he gets in range, he makes a turn. Something told him not to continue to the trail running under your tree stand. Probably why he got so darn big. The prickle on the back of your neck stops, the hair lays back down, pulse slows and the tingling sensation is gone, until the next time. I have hunted deer with a bow and arrow and also with a rifle for many years. I must say I prefer archery hunting. We usually hunted when there was snow on the ground. You have a way to track a deer if you happen to not hit him in a vital spot with your arrow. The idea is to wait for a close shot and not have to track the deer. Tracking can be very hard without snow, my brother and I have tracked a deer for a full day when there was no snow on the ground. A blood trail is very hard to follow on leaves, especially if they’re deep wet leaves. One Fall the archery season had been open for close to two weeks, but we still had no snow on the ground, it was an exceptionally warm Fall with thunderstorms and everything but I still wanted to hunt. I was situated up in my tree stand early one morning, long before first light, waiting by a well traveled deer trail. I could hear thunder off in the distance and there was a lot of sharp lightning. The storm kept getting closer. I thought about walking to my pickup which was about a quarter of a mile away, then I thought this storm will pass in a hurry, I’ll just sit it out in my tree with my rain jacket on. I didn’t have to wait long for the storm to get there, there was lightning hitting in several places in the trees where I was at. Suddenly, I could smell sulfur, almost taste it. The skin on my neck started to prickle big time, as the hair stood up, it seems like the hair on my head stood up raising my hat even. 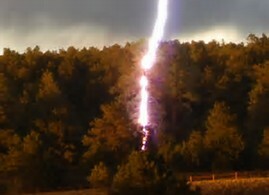 Lightning struck the tree next to mine, the boom was incredible, it shook everything. My ears were ringing, it almost knocked me out of the tree stand, I laughed at safety belts once, it was a good thing I had one on. That was enough hunting for me for that day. I felt the need to go home and change clothes, hoping it was just from the rain and nothing more. That prickle job on my hair must have frayed some nerves too, it was finally dawning on me, I almost got zapped. Yes, I seem to have a protector riding shotgun for me, no matter where I go.